Scented with many of the spices of chai, these muffins are wonderful with hot black tea. 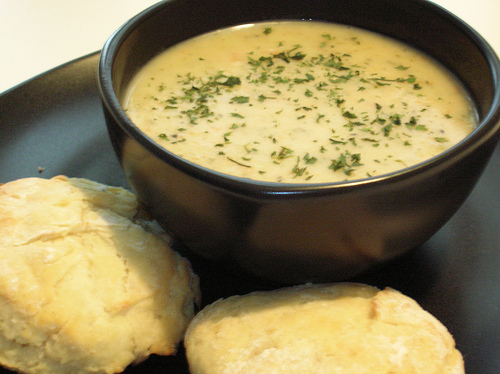 In a small saucepan, bring milk and tea to a simmer over medium heat. Remove from heat, cover and let steep for 10 minutes. Strain through a fine-mesh sieve into a medium bowl, discarding tea leaves, and let cool. In a large bowl, whisk together flour, baking powder, cinnamon, cardamom, ginger, baking soda, salt and cloves. Whisk brown sugar, yogurt, oil and vanilla into milk mixture until well blended. Add the yogurt mixture to the flour mixture and stir until just blended. Bake for 19 to 23 minutes or until tops are golden brown and a toothpick inserted in the center comes out clean. Let cool in pan on a wire rack for 5 minutes, then transfer to the rack to cool. 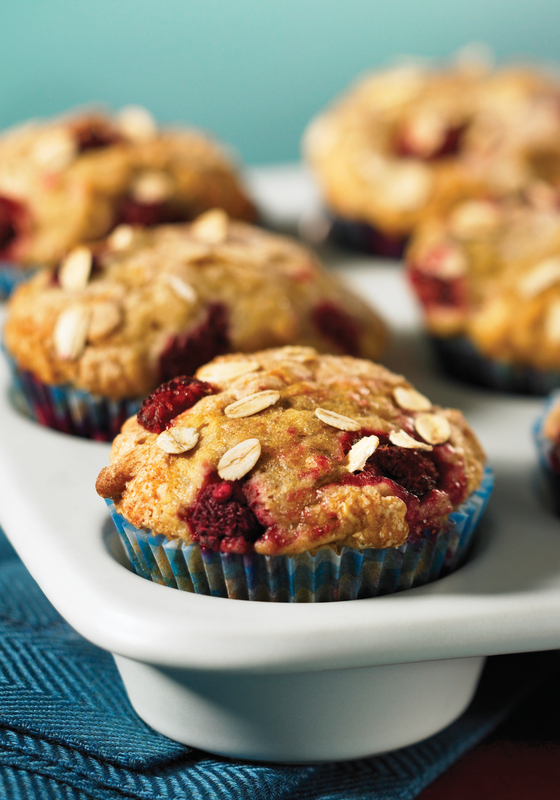 These tempting, raspberry-filled muffins are a nice (and healthy) way to get started in the morning. In a large bowl, whisk together flour, oats, brown sugar, baking powder, baking soda, salt and allspice. In a medium bowl, whisk together egg, milk, butter and vanilla until well blended. Add the egg mixture to the flour mixture and stir until just blended. Gently fold in raspberries. Divide batter equally among prepared muffin cups. Sprinkle with granulated sugar. Bake in preheated oven for 16 to 21 minutes or until tops are light golden brown and a toothpick inserted in the center comes out clean. Let cool in pans on a wire rack for 5 minutes, then transfer to the rack to cool. © 2010 www.robertrose.ca Reprinted with publisher permission. And 750 Best Muffin Recipes did not disappoint. This is a fantastic baking book and one that every muffin lover needs to have! What do I like about this cookbook, well…everything actually! Another plus, from what I’ve noted so far, none of the recipes are heavy on sugar or a lot of other unhealthy ingredients…it really is the ultimate muffin-lovers collection and I’m so glad to have a copy to enjoy, again and again and again! 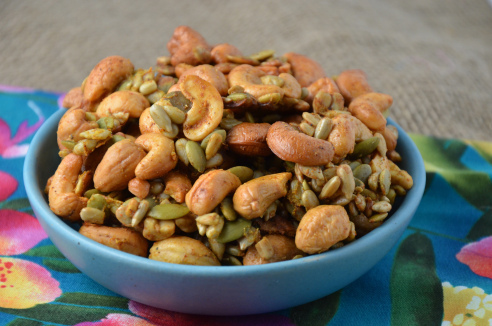 The only thing that I am tweaking a bit in each recipe is when adding: coconut, fruit, nuts, etc…to the mix. I always add these with the dry ingredients, (not as the last additions) to dredge them with the flour etc. and to help to keep them from sinking to the bottom of the muffins when mixed. A little baking tip that has worked well over the years. No problem making this slight change and for me, it’s just a long-time personal preference. And I hope you enjoy the two luscious muffin recipes featured above,that were graciously provided by Robert Rose, the publishers of this cookbook. 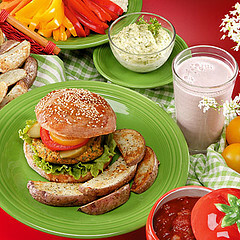 Stop by their site to see all their bestselling cookbook choices. 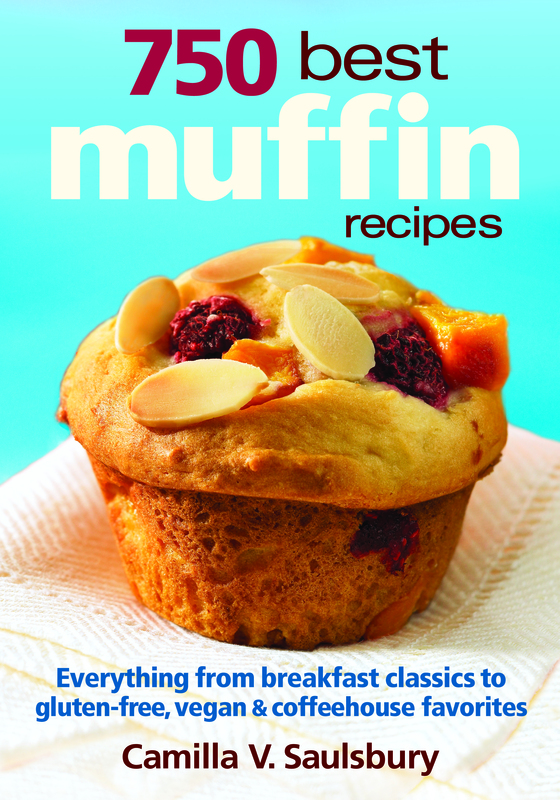 And definitely DO plan to order a copy of 750 Best Muffin Recipes soon! And this time of year, it seems like there are pumpkins and pumpkin recipes everywhere. Last week, I was looking for a new recipe for a muffin that would include not only pumpkin, but dried cranberries and pecans too. They turned out great. A lovely dense but moist texture, flavorful and colorful too. I did cut back a bit on the sugar, used unbleached flour and added a dash of cloves and nutmeg to the dry mix too. 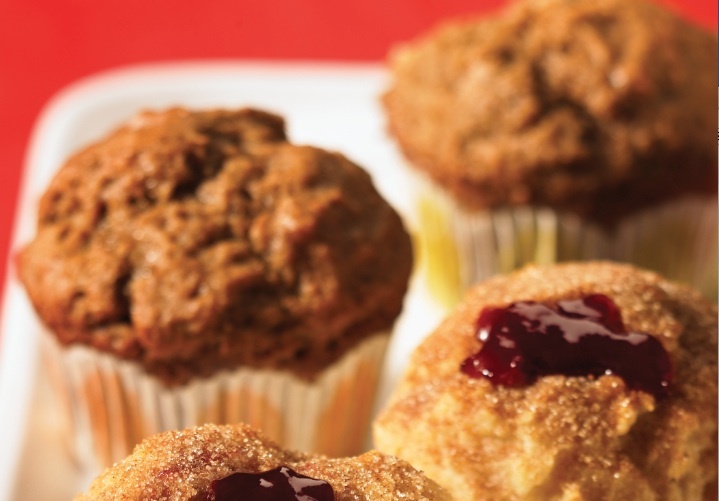 If you like pumpkin muffins, you’re going to ♥ these! Any fav pumpkin recipes (sweet or savory) to share? Please do. 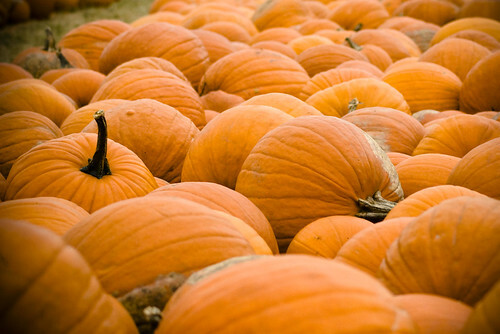 IMO, there’s no such thing as too much pumpkin….and it’s so good for us too! This oh-so yummy photo of Apple Brown Betty stopped me in my WP tracks this morning. 😉 I want some right now. I make a similar dessert but definitely not with that much butter or sugar. 😦 The photo did inspire me to make some soon though. 🙂 Do you have a fav Brown Betty recipe? Brown Betty is a traditional American dessert made from fruit (usually apple) and sweetened bread crumbs. It is similar to a cobbler or apple crisp, and the fruit is baked. It is an old dessert, first mentioned in print in 1864. Apple Brown Betty was one of the favorite desserts of Ronald and Nancy Reagan in the White House. They served Apple Brown Betty at my elementary school cafeteria and I loved it. They served real food back in the sixties and seventies! Recipe for Apple Brown Betty from Pioneer Woman here! Have You Ever Made Rye Bread from Scratch? (click to see full recipe with how-to photos). I’ve printed out the recipe and have all the ingredients on hand, so I’m ready to go! Speaking of printing the recipe, if you copy it from The Hungry Mouse, you’ll just get the text when you paste, which suited me fine. I didn’t want to have to delete all the photos before printing. 😉 The photo above is actually from Flickr. For any of you who have tried rye bread making before, you’ll probably already know that a lot of these recipes are complicated and take a lot of time. This one doesn’t. I’ll let you know how mine turns out. It’s a perfect day for baking here in BC, rather chilly and rainy. We are having a cool start to summer here but that’s just fine by me. I MADE THIS CARROT CAKE WITH ICING (AGAIN) YESTERDAY. YUMMY AS USUAL. I’m not much of a dessert fan but I do love this cake! PS: If you click through to read the rest of the post, you will see the updated version with a couple of new things added. The original post is showing up here but not when you click through to read more. Another quirk I just found out about when posting with WordPress and in this case, reblogging. I thought with the fall’s garden harvest in full swing, this might be a good time to share this carrot cake“keeper” again. Yes, it really does taste as good as it looks. Let me know if you give this cake (and hopefully my icing too) recipe a try. If you and your family like carrot cake, you are going to be loving this one, I’m sure!